I did ! I think I posted something about this movie.. I forgot what it was about, lol. Oh, I think I asked where was the might US army in all this ? And where were the gangs of LA ? they could have easily fought with the soldiers. This is one of two, maybe three alien invasion movies of the last few years which did not come close to delivering what it could have done. If you’re looking at a pure alien invasion movie then i don’t think I’ve seen anything good for quite a while. Recent good ones I can think of are District 9 and Super 8. But you are right, they are few and far between. Ive still to see Super 8 but I do like District 9 a lot. I saw it. I liked it more than you actually. 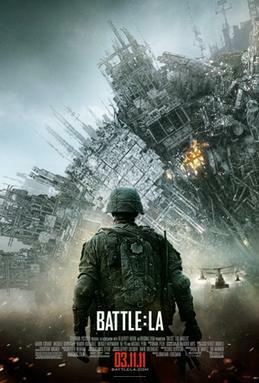 better than other alien movies of recent memory. but it still had opportunity. ha. your post made me laugh with that Michael Bay bit! Maybe Michael Bay’s abundant resources is what this guy needs to unleash his full potential!